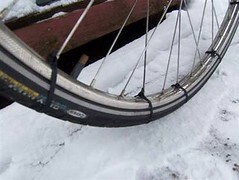 From BikePortland comes an idea for a cheap substitute for tire chains or studded tires for those of you who don’t normally bike on snowy roads. Use zip ties on your tires for extra traction on snowy roads. These will interfere with the brakes, of course, so it’s suitable only if you have a fixed gear bike or some sort of hub or disk brakes. You’ll also need to check for clearance. I own a mountain bike with studded tires for those icy snow days and myfixed-gear doesn’t have the clearance for this solution. Somebody let me know if this actually helps or not. The original instructions recommend placing these only on the rear tire, but experienced icebikers know that it’s better to have traction on the front for control. I don’t know, though, if zipties provide any control, or if they’re just better for traction. Hmmm… Very clever idea for rear traction, but in the front, I’d guess one would really want something that keeps the wheel from slipping sideways, which this doesn’t seem like it would help with at all. seems clever but be careful, that plastic is slippery when wet, might be uselss on wet snow.